Colt M4/1911 Ops Airsoft Gun Kit - M4 RIS Rifle and 1911 Pistol - 500 Airsoft BBs - Accessories | BUDK.com - Knives & Swords At The Lowest Prices! Two guns. Multiple accessories. One unbeatable price. Infinite airsoft fun. Dominate your fiercest airsoft rivals without forking over stacks of cash for gear! 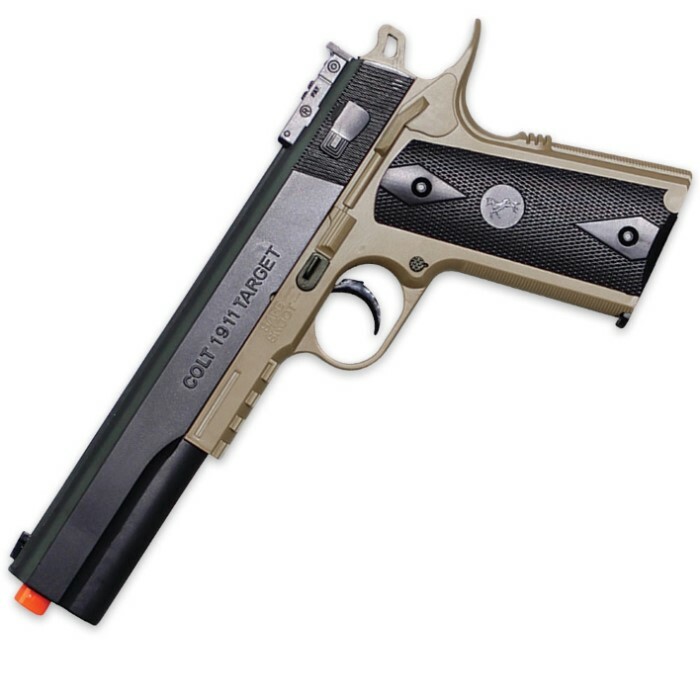 From legendary firearms manufacturer Colt, the M4/1911 Airsoft Ops Kit is devastating on the battlefield but gentle on your wallet. 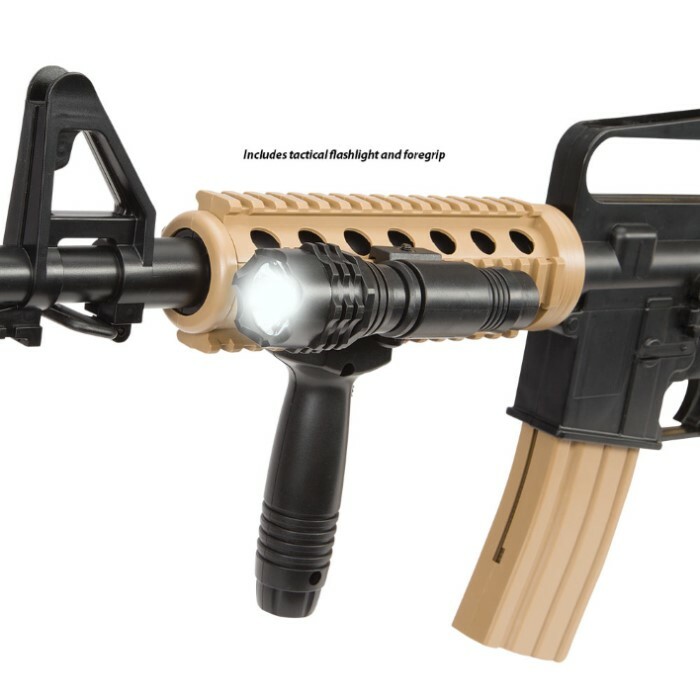 It represents perhaps the best value on the airsoft market today, with everything you need to lay waste to your opponents in one convenient, surprisingly affordable kit - Colt M4 rifle, Colt 1911 pistol, 500 6mm airsoft BBs, paper targets, vertical rifle grip and mounted flashlight. 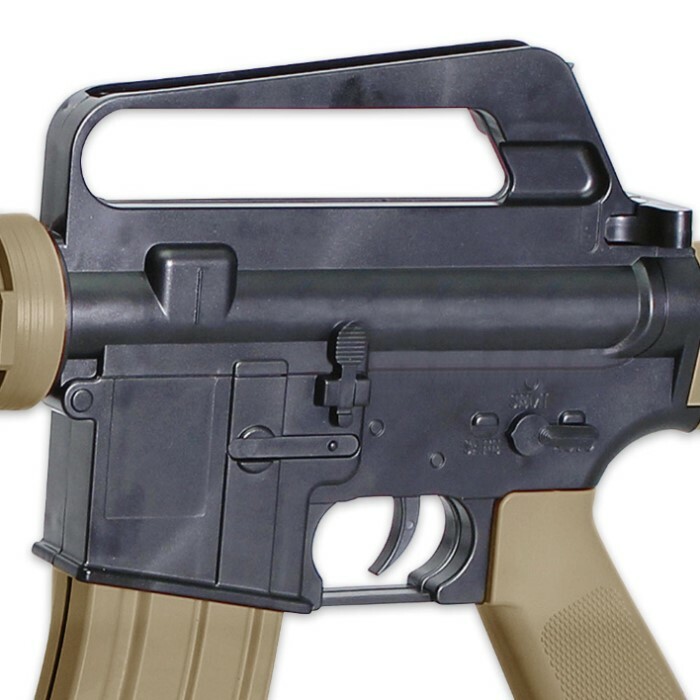 Inspired by legendary namesake, Colt M4 boasts impressive field capability, RIS expansion versatility, much more. The spring-powered M4 oozes bold tactical style and packs ample muscle to back it up, with an impressive 147' range and powerful 300-fps muzzle velocity. 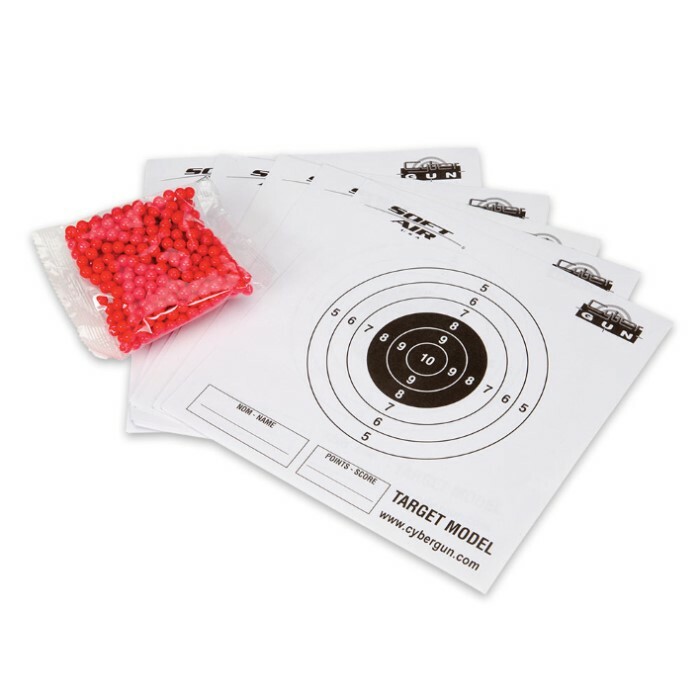 It boasts incredible shooting accuracy right out of the box, and the included paper targets provide an easy, fun way to finely hone your aim. For effortless dead-on shots, add a laser sight, optics or other performance-enhancing accessories via the advanced rail interface system (RIS). But valuable add-ons, incredible shooting power and pinpoint precision are meaningless when you have to stop to reload constantly, leaving you vulnerable and unable to fend off opponents. Thankfully, the M4 has you covered there, too, with a generous 300-round magazine capacity. Even airsoft soldiers need a reliable combat sidearm. Colt 1911 pistol + M4 rifle = a match made in airsoft heaven. An ideal accompaniment to the M4, the spring-powered Colt 1911 pistol affords a vital additional layer of firepower and generally boosts your combat adaptability and effectiveness. The 1911 is small enough to comfortably conceal beneath clothing yet every bit as effective as its big brother, the imposing M4. With a potent 210-fps muzzle velocity, remarkable 66' range and an ample 12-round magazine, the 1911 is your ultimate supplemental battlefield sidearm. Perfect starter kit for beginners, convenient all-in-one solution for pros, unequaled value for all! Perfect for airsoft beginners and seasoned pros alike, the M4/1911 Ops Kit lets you start or expand your airsoft arsenal - all without breaking the bank or scouring the Web for multiple guns and accessories. You won't find a better price on this outstanding airsoft ensemble anywhere else, so order today and begin your rise to the top. 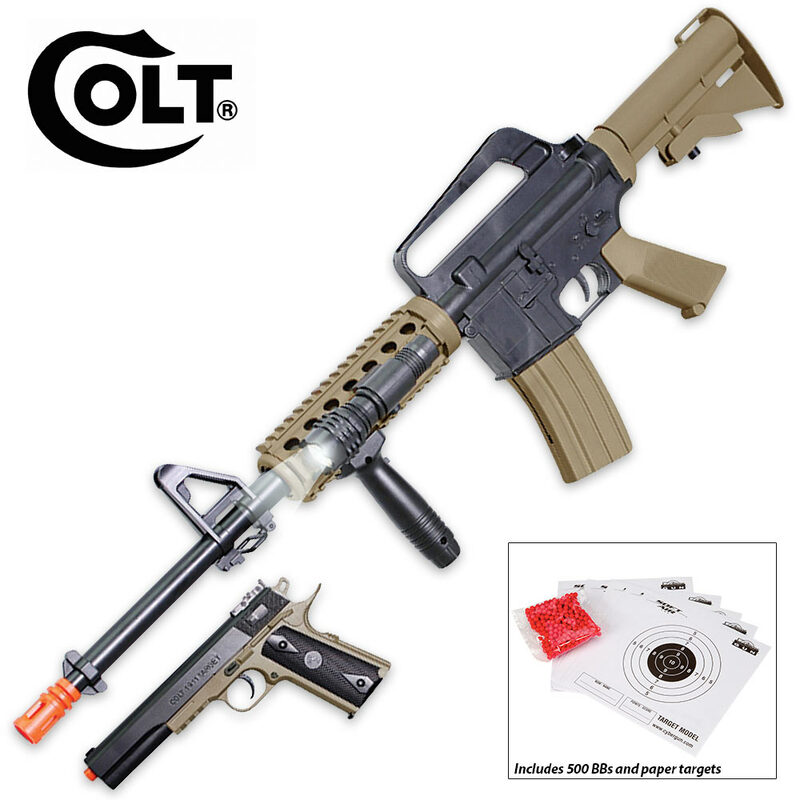 No doubt about it - the road to indisputable airsoft supremacy is paved with Colt's exceedingly capable M4/1911 Ops Airsoft Kit.